Thanks to the partnership that Miss Millennia has with Discount Tire on this post, we are happy to be sharing our #throwback #cruisetunes playlist with you. There’s no feeling that quite matches the first taste of freedom that you get when you first get your license. At 16, the whole world seems to be open before you when you have a car. No more than 45 minutes after I received my license, I was out the door with keys in my hand to visit my friends. I spent a lot time driving anywhere and everywhere after that. I went through a lot of gas and a lot of music during that time, and whenever I hear one of those songs from my first year of driving, I’m instantly taken back. 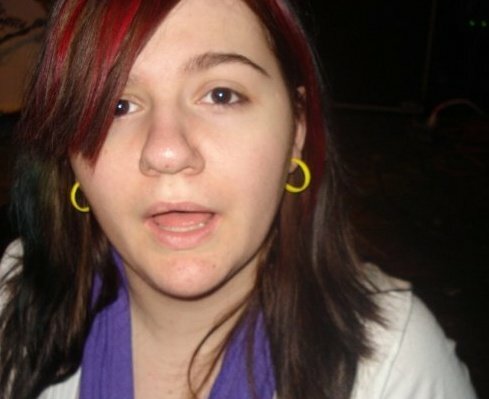 Me at 16 with red highlights and all. This is roughly what I am taken back to. About a month after I got my license, I drove myself to a concert for the first time. Despite getting lost in an unknown city, it was an amazing night. I almost never smiled in my teenage pictures because I was very bitter about my braces, hence the odd open mouth picture. Just like your parents worried over your car safety, we want everyone to end the summer by staying safe and saving money, which is why you should head over to Discount Tire to get quality tires for your drives without breaking the bank. Discount Tire is the world’s largest independent tire and wheel retailer and has celebrated more than 50 years of service. That being said, in honor of the new school year starting, we’ve compiled the ultimate #throwback playlist with a broad range of #cruisetunes to take any Millennial back to their first driving days. To listen to the list, you can see our Youtube Playlist here. Or view the videos below. We Want To Hear From You And Give You Some Cool Prizes! 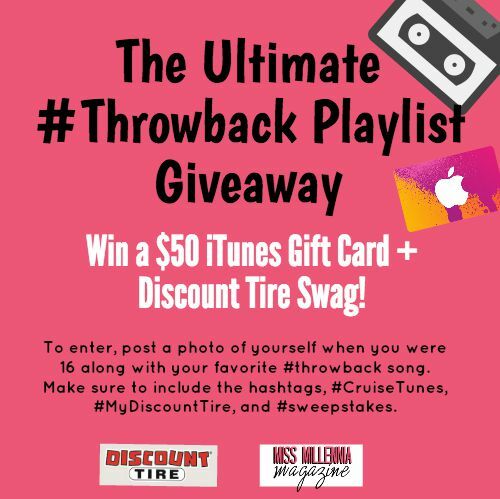 Thanks to our partnership with Discount Tire, we are doing a giveaway so you can get all the #Throwback #cruisingtunes you want from iTunes as well as some cool swag from Discount Tire. To enter, post a photo of yourself when you were 16 along with your favorite #throwback song on either Facebook, Twitter, or Instagram. Make sure to include the hashtags, #CruiseTunes, #MyDiscountTire, and #sweepstakes.